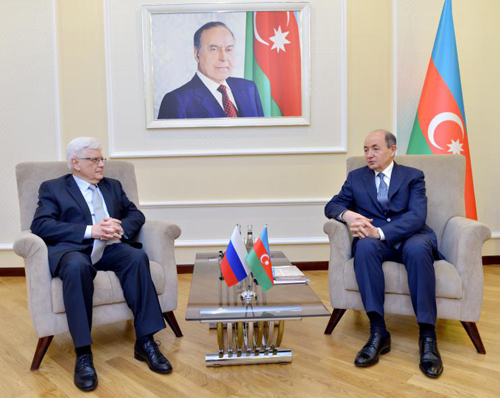 The Minister of Justice Fikrat Mammadov met with the ambassador extraordinary and plenipotentiary of Russian Federation in Azerbaijan Mikhail Bocharnikov. Noting that there is close friendship and cooperation relations between Azerbaijan and Russia, the Minister stressed the special role of our heads of states in the development of these relations and noted that, relations based on a rich contractual base have also been successfully developing in the legal sphere. The importance of mutual visits of delegations and joint measures held for the purpose of exchange of experience was mentioned at the meeting by notifying about applied innovations and works made on modernization of justice and court system under the leadership of the President Ilham Aliyev and it was stressed that, there are good opportunities for expanding cooperation between the justice organizations of the two countries. The ambassador, noting that there are always good relations between our countries, said that these relations are at a high level by the will of the Russian and Azerbaijani presidents and he is well informed about the effective cooperation between the justice authorities of the two countries. The guest, expressing his satisfaction for the business relations with the embassy, said that, during the period of his activity he would make every effort to strengthen relations, as well as legal relations with Azerbaijan in all spheres. During the conversation there was made useful exchange of ideas on a number of issues having interest. The guest got acquainted with the Museum of Justice History.